It is perfectly possible to read and enjoy Russell Hoban’s masterpiece Riddley Walker without solving or even being aware of the riddles woven into the story. You struggle with the language for a time until its phonetic nature becomes clear, and you congratulate yourself for having passed a barrier that few casual readers breach. You struggle with the mysterious myths and legends that abound but fasten inevitably upon what seems to be an answer to Riddley’s comings and goings about “Inland,” his name for the future dystopia of Kent. It is all about the rediscovery of the secret of gunpowder, the first step in mankind’s march to the suicidal beat of technology toward a second (or third, or fourth) “one big one” destroying “the world as we know it.” You understand now. You’ve stuck in your thumb and pulled out a plum; what a good boy (or girl) you are! You have entered that elite group of those who actually “grasped” Riddley Walker. Or have you? Still, there is something about the story that keeps drawing you back. You read it again. The second or third or fourth time through perhaps you become aware of a shimmering, intriguing, consistent suggestiveness behind all the tales and lyrics that occupy so much of the story. Perhaps you are now ready for the final great revelation that Hoban has planned for the truly knowledgeable and observant, the even better boys (or girls). Reality is ungraspable. For convenience we use a limited-reality consensus in which work can be done, transport arranged, and essential services provided. The real reality is something else—only the strangeness of it can be taken in and that’s what interests me: the strangeness of human consciousness; the strangeness of life and death; the strangeness of what the living and the dead are to one another; and the strangeness of ideas . . . that seem to have been with us from long before the stories of them happened. The real reality, the flickering of seen and unseen actualities, the moment under the moment, can’t be put into words; the most that a writer can do—and this is only rarely achieved—is to write in such a way that the reader finds himself in a place where the unwordable happens off the page. Most of the time it doesn’t happen but trying for it is part of being the hunting-and-finding animal one is. If reality is “ungraspable,” as Hoban suggests, what is it you have grasped? Will you open your hand and discover, as Easyer will at the end of the novel, not a real baby but merely a painted puppet made of wood? What kind of trick is this? After laboring over the first draft of the novel, a not-insignificant 500 pages, Hoban spent another long period, five years in all, coming up with the revised version as finally published. Five years doing what? Well, reworking the language, obviously, but it seems apparent, also restructuring the novel, cutting half its length. Perhaps taking the real reality off the page, but still leaving it in the aura of the novel for astute readers to discover? That, at least, is the premise of Farring Seakert Sailor, Darrell Emmel’s remarkable reading of the novel, subtitled Unriddling Riddley Walker. (Ex Machina Publishing, on Kindle). Having conceived of the idea of instilling this novel with an “off the page” reality, Emmel suggests, Hoban conceived of a kind of “reality” that would be consistent with the culture of which Riddley was a part, a foraging band, or in anthropological terms, a band of hunter-gatherers. Riddley Walker presents the reader with a foreshortened view of the story of mankind, in which the various waves that more or less sequentially washed over the planet — the hunter-gatherers (the “roaders”), the agriculturalists (“formers”), and the statists, pseudo-technological, proto-industrialists (the “Ram”) — all exist together, overlapping each other and providing the story with much of its combustible conflict. Riddley himself, at twelve years of age, labors in each of these realms, but it seems obvious from the first page that the “roading” tradition is doomed. He himself has killed the last boar in this part of Kent, so that, lacking wild game, roaders will have to “sing for their supper” like anyone else. Not only do he and his compatriots work in the dangerous pits from which they extract the iron from a long-past industrial age, but he inherits from his father the semi-official role of “connexion man,” a kind of local translator of Ram propaganda. In the “connexion man” we recognize a common tactic as one culture takes over another, appropriating the aspects of the “lower” culture to fill parallel but quite different roles in the “higher.” In his own culture, Riddley and his father Brooder would have been “reveal men,” or as we might say, shamans. The “tel” woman Lorna Elswint recognizes Riddley’s particular talents — his super-sensitivity to “signs,” the emotion (and motion) he displays in reaction to forces unseen, his tendency to go into a trance, as he did in his first “connexion” following his father’s death — all of which sustain this interpretation. Hoban might have chosen the “real reality” of any of the other hunter-gatherers known to man—the American Indians of the northern plains, the bushmen of Africa, the aborigines of Australia, all those who lived off wild plants and animals, moved from one camp to another throughout the year, and sat around a campfire at night watching the sparks rise up toward the great panorama of stars, telling stories of creatures and beings who seemed to inhabit the nighttime sky. But Hoban was an American expatriate, an Anglophile who had made himself familiar not only with the canon of English and European literature, but also with the mythologies of England and Europe. And predominant among the mythologies was that of the Celts, those mysterious people who arose in the Mideast and spread across Europe prior to the rise of the “civilizations” of Greece and Rome, and had perhaps arrived at their “last stand” in the British Isles, notably in Wales, Scotland, and Ireland. Hoban was acquainted with the great works that conveyed the culture of the Celts, including Robert Graves’ The White Goddess, Welsh bards, Taliesin, and those who, like William Blake, used the ancient Celtic faith to turn Christianity on its head. Of particular interest to Hoban were the Celtic bards who used riddles to refer to their tradition. The Celts were known by the Greeks and Romans as strange barbaric people who spoke in riddles that obscured their culture from the uninitiated; even Julius Caesar spoke of it in his well-known work on the Gauls. In fact, the Celtic faith lay in direct opposition to the patriarchal religions of the Mediterranean, which did everything possible to demonize such beliefs. Moreover, Hoban seems familiar with the eco-radical writings appearing in America and elsewhere in the 1960s and 1970s, which, like the writings of Paul Shepard, embraced the notion that since the agricultural revolution, mankind has ceased to see itself as part of the ecology of the planet, facing extinction as a result. Shepard’s seminal work, Man in the Landscape, An Historic View of the Esthetics of Nature, seems to have been a quite possible influence particularly, leading to such riddling tales as The Lissener and the Other Voyce Owl of the Worl and Why the Dog Wont Show Its Eyes. The last wild boar, at the beginning of the novel, is reflected in the Punch show at the end, in which Punch has become the boar, Judy the sow, and the baby a piglet. Riddley knows that in losing the boar, they have lost something essential to their well-being, both physically and spiritually. His whole progress toward the end of the novel might be christened Coming Home to the Pleistocene, the name given Shepard’s posthumous collection of writings. “In Robert Graves’s The White Goddess and in the work of other mythographers you can read of the triple aspect of women as perceived by ancient primitive males and recorded by modern scholarly ones: she is successively the maiden, the mother, and the hag. The version of “the hag” in Riddley Walker is deliciously bizarre: “Aunty,” an unforgettable personification of death. Every thing has a shape and so does the nite only you cant see the shape of night nor you cant think it. If you put your self right you can know it. Not with knowing in your head but with the 1st knowing. Where the number creaper grows on the dead stones and the groun is sour for 3 days digging the nite stil knows the shape of it self tho we don’t. Some times the nite is the shape of a ear only it aint a ear we know the shape of. Lissening back for all the souns whatre gone from us. The hummering of the dead towns and the voyces before towns ben there. Befor the iron ben and fire ben only littl. Lissening for whats coming as wel. My favorite kind of story is the smoky evocation at which de La Mare excels: with his perceptions of the perhaps, his attention to the whispers of the unseen and his recognition of those realities not always recognized, he spins invisible webs to catch the unspoken. 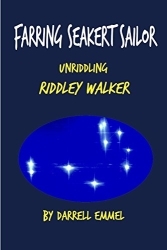 The unspoken in Riddley Walker is a mythology of ancient constellations. The stars are absent in the skies because they are present in the story itself. This is not the place to furnish all the connective tissues for Emmel’s complex but persuasive argument. For that you must go to his book. There you will be given guidance enough to find hints of “the first knowing” which of course can not be told in words. Emmel, Darrell. Farring Seakert Sailor: Unriddling Riddley Walker. Ex Machina Publishing. 2016. Ron Robinson is Consulting Editor, Ex Machina Publishing Co. Psychological Types, appearing in 1971, may have suggested the name "Brooder" for Riddley's father, as Darrell notes. Clearly, symbols and signs in the novel show that Hoban was aware of Gimbutas' work on the civilization of the goddess. David Erdman's The Illuminated Blake and S. Foster Damon's A Blake Dictionary also appeared just before Hoban began Riddley Walker and may have influenced the novel's cast of characters and their portrayals. Hoban must indeed have been a voracious reader.